Just don't try to buy anything in the evening. This week a Paris court of appeal ordered the cosmetics chain Sephora to close its flagship store on the avenue at 9 p.m., rather than staying open until midnight during the week and until 1 a.m. on Fridays and Saturdays. It was the latest ruling over store-closing hours that has already forced several other big name retailers in Paris both on and off the avenue to close early, including Apple, France's Monoprix and the Japanese clothing retailer Uniqlo. 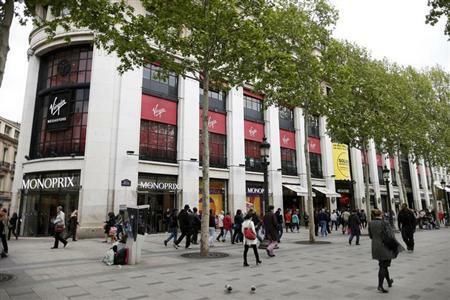 Two other stores on the Champs Elysées, Abercrombie and Fitch and perfumer Marionnaud, are also facing legal action. France has a raft of regulations governing shopping, and its labor unions ensure that they are strictly enforced. As well as strict limits on opening and closing hours, the rules only allow sales during certain periods of the year, price promotions are circumscribed, loss leaders are illegal, store sizes are limited and even the types of shops allowed to open up are regulated. The Swedish clothing retailer H&M fought a long legal battle against the Paris city authorities before it won permission in 2008 to open on the Champs Elysées; City Hall vetoed the plan on the grounds that it was one clothing store too many, and would change the character of the avenue. The issue was finally decided in H&M's favor by the Conseil d'Etat, the nation's highest administrative court. For the most part, these rules just provoke a Gallic shrug in France itself. But at a time when the national economy remains stuck in a rut and unemployment continues to rise, this latest ruling on Sephora has struck a raw nerve. The case was brought by a consortium of labor unions, which has been zealous in its attempts to have the store-closing hour law enforced, arguing that it needs to protect workers from unscrupulous owners who force them to work antisocial hours. But that logic is patently untrue in this case. The cosmetics chain reckons it does about 20 percent of its business after 9 p.m., and the 50 sales staff who work the late shift do so voluntarily — and are paid an hourly rate that is 25 percent higher than the day shift. Many of them are students or part-time workers, and they have publicly expressed their indignation about being put out of work by labor unions. The judge refused to take into consideration a petition they presented to the court, saying the case was a matter of public order, so now they are taking their campaign online, including with a Facebook page. Sephora says it will appeal the decision. Political reaction has been swift. Pierre Lellouche, a member of parliament for Paris whose constituency includes the Champs Elysées, called the regulations "suicidal," and said it was "scandalous in our country, where the unemployment rate is above 10 percent of the active population, that unions should fight against jobs, and even more worrying that the law should be on their side." The national employers association has called for the laws to be changed. And an association of store owners on the Champs Elysées has worried publicly about wealthy tourists going elsewhere to shop, including London, where there are far fewer barriers to their ability to spend money. It's not clear whether this case might turn out to be a tipping point in favor of consumers. What is certain, however, is that France remains wedded to highly regimented forms of business that are hard to change, and which place protection of the status quo far ahead of the interests of consumers and the economy as a whole. While there is a French anti-trust commission charged with promoting greater competition, it is relatively weak and overshadowed by a more powerful and much larger sister agency that enforces the regulations. And France's code of labor legislation, with its 981 articles, is about four times the volume of that of neighboring Germany, itself no slouch when it comes to protecting workers' rights. Two big department stores near the Paris Opera, Galeries Lafayette and Printemps, both very popular with tourists, have calculated that they could increase their revenues by at least $200 million per year and employ an additional 1,000 full-time staff if they were allowed to open more often on Sunday. Unlike the Champs Elysées stores, which have a legal exemption to open on Sundays because they are in zones classified as highly touristic, the two department stores are only allowed to open on five Sundays per year. Retailing regulation is the most visible, but many other consumer-oriented businesses are also subject to rigidly-enforced rules. Taxis, hairdressers, public notaries and many others are governed by "obsolete regulation," according to an official 2008 report on ways to open up the French economy, written by Jacques Attali, a writer, consultant and former top government official, who argued that it was time to blow up the rules and liberate producers and consumers alike in order to create jobs and give a boost to the economy. Among other things, he recommended eliminating a 1973 rule that limits the numbers of bars with alcohol licenses; enabling hairdressers with five years experience to open a salon without having to pass a special exam; dumping a quota system that limits the number of pharmacies, and breaking a taxi monopoly in Paris that restricts the number of cabs in the French capital and can make it hard to find one at peak hours or when it's raining. Cab drivers immediately staged a protest that blocked streets for hours, and the government responded by shelving any reform plans. That sounded the death knell for the Attali report more generally. So far, President François Hollande and his socialist government have shown no signs of wanting to change the status quo. To do so would mean taking on the labor unions, a core constituency. But when jobs and growth are so obviously at stake, letting people buy lipstick at midnight seems a small price to pay.